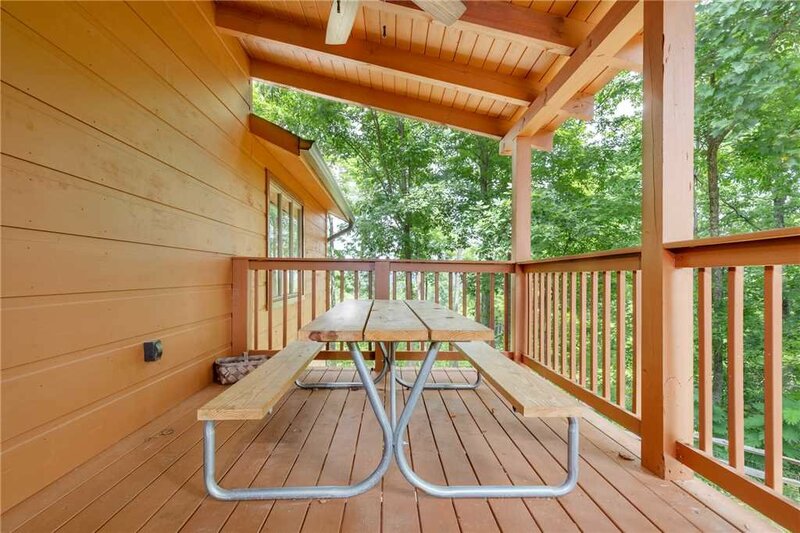 Parkside Lodge can accommodate a small crowd: twenty-six guests, to be exact. 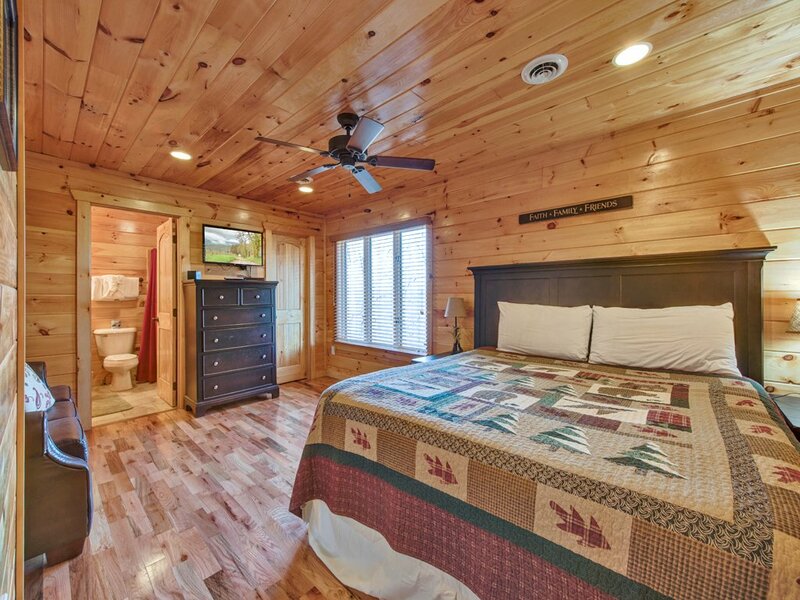 But this 4,400-square-foot log home offers much more than the ability to sleep more than two dozen people. 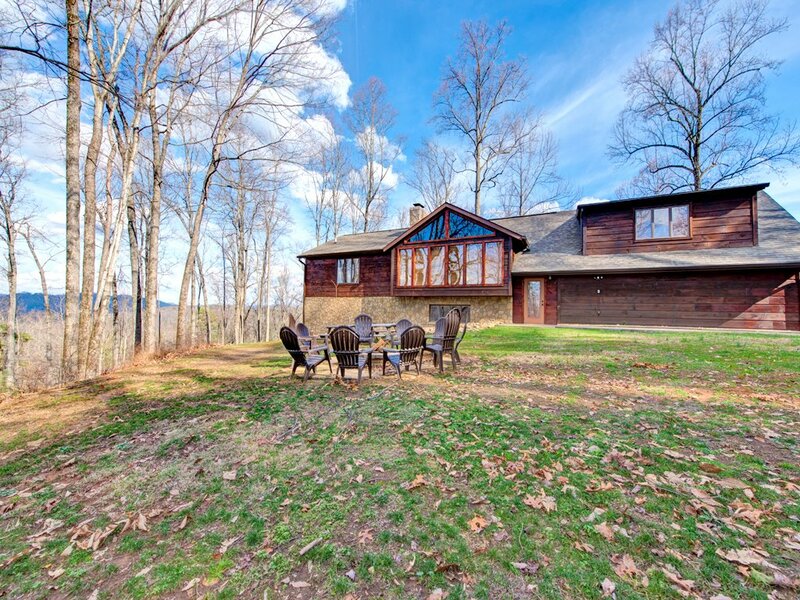 Located on two private wooded acres, it includes such luxuries as a hot tub, a home theater with a 70” screen, a pool table, and a fire pit. 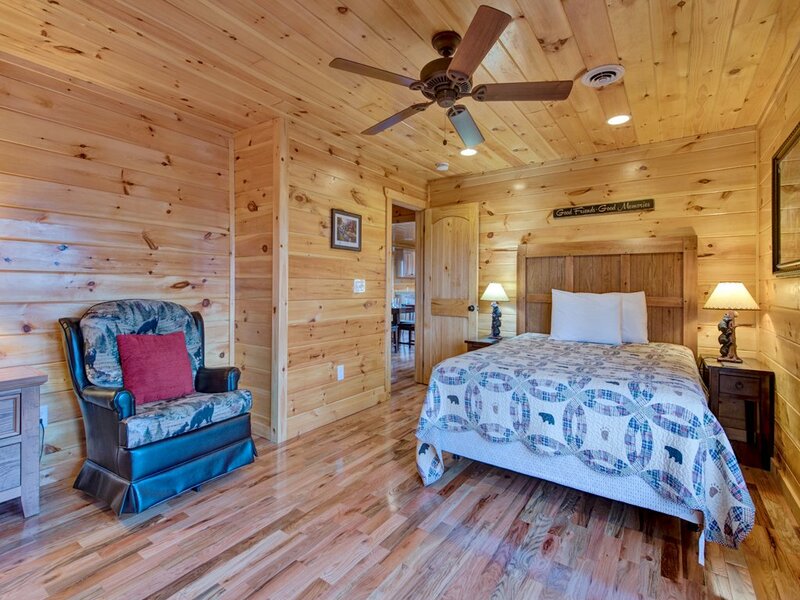 Recently renovated to a five-star standard, Parkside Lodge will induce oohs and aahs even before you step inside. 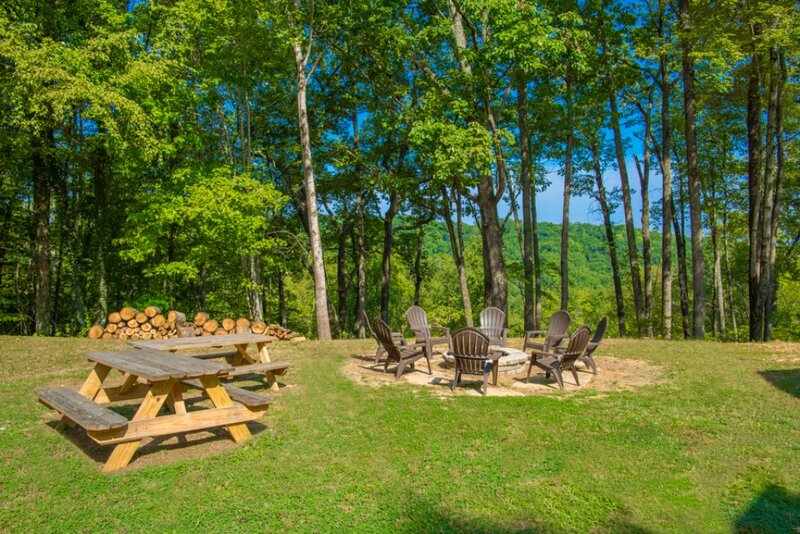 The lush grounds include picnic tables for dining alfresco and a fire pit surrounded by Adirondack chairs where you can toast marshmallows and search out constellations long into the night. 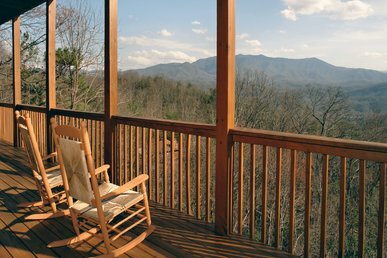 Through breaks in the trees you can spy the Great Smoky Mountains; in fact, the Great Smoky Mountains National Park is just a few minutes away. 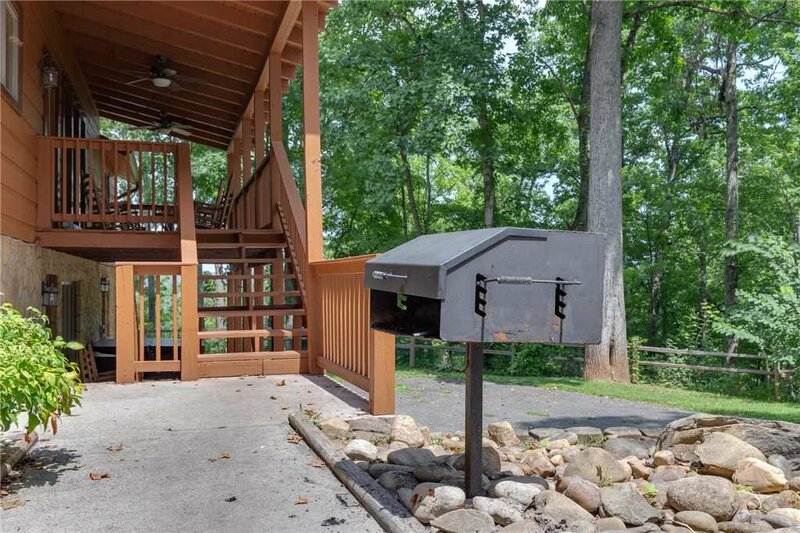 The huge covered deck has its own picnic table so that you can set up a buffet of snacks to enjoy as you gather on the rocking chairs to catch up on old times and make new memories. 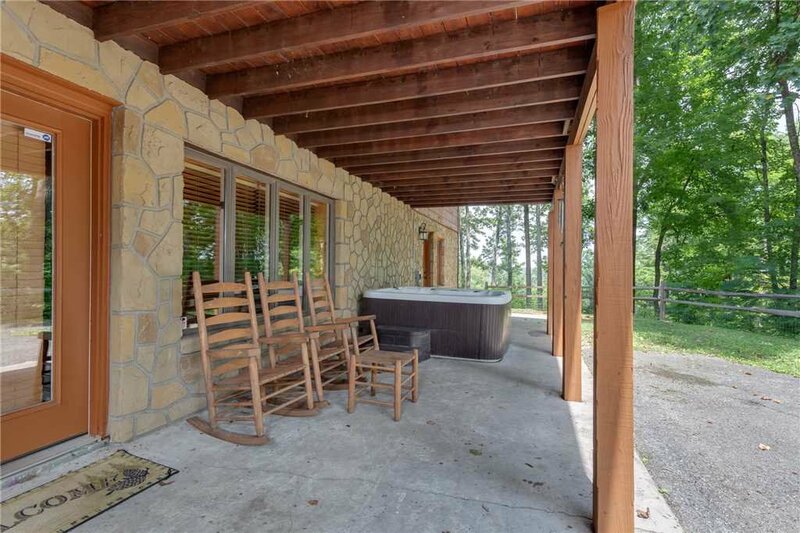 There are rockers on the patio too, as well as a hot tub that can accommodate seven people at a time. 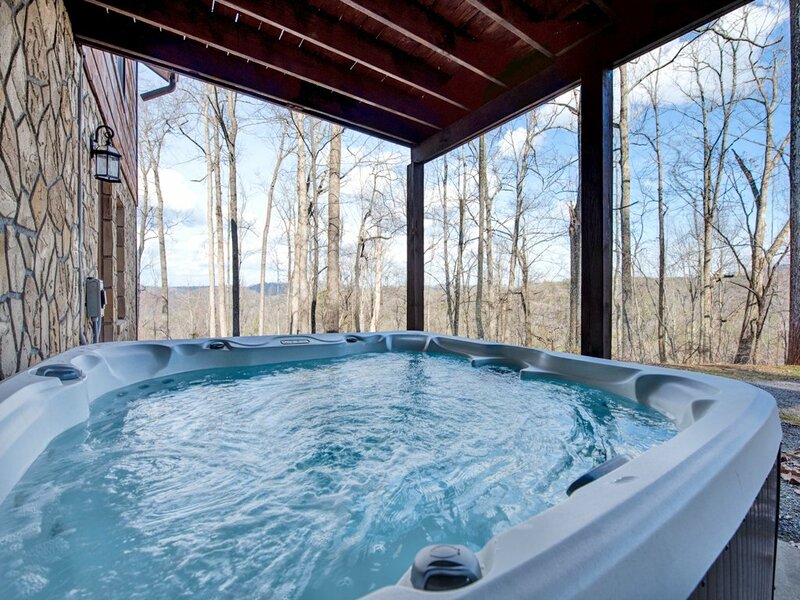 Is there a better way to end a day of hiking, biking, or white-water rafting than soaking among steamy jets of water amid the crisp mountain breeze? We don’t think so! 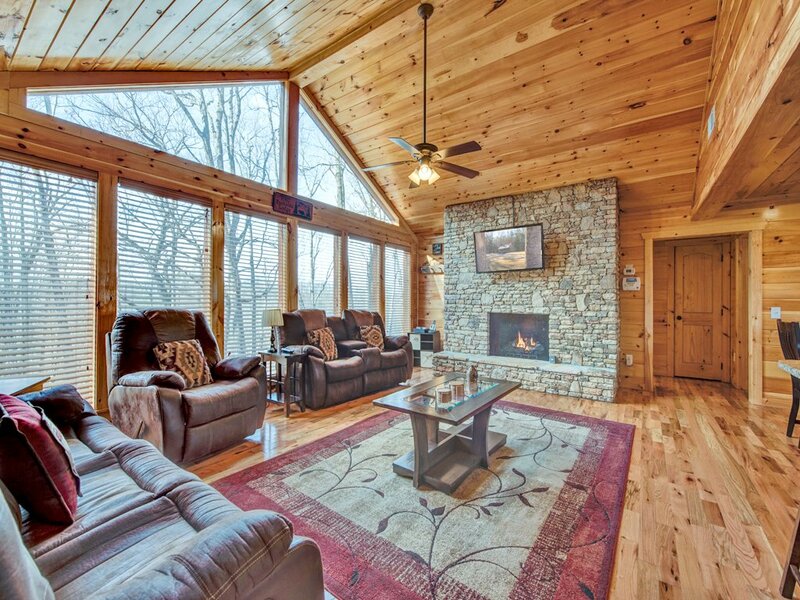 A wall of oversize windows lets you admire the beauty of the surrounding woodland even as you relax in the great room—and what a great room it is! 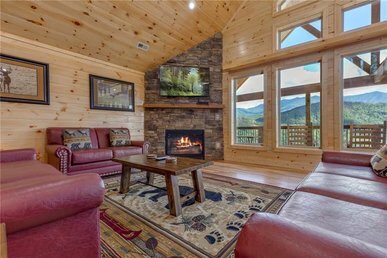 Roomy leather seating, a fireplace in a stacked-stone wall, a 50” flat-screen TV, a vaulted ceiling: This is a space designed for relaxation. The dining area seats ten at the table and another eight at the adjacent breakfast bar. If there are kids in your group, you can let them have the breakfast bar to themselves while the grown-ups sit at the table—we’re sure they won’t mind! 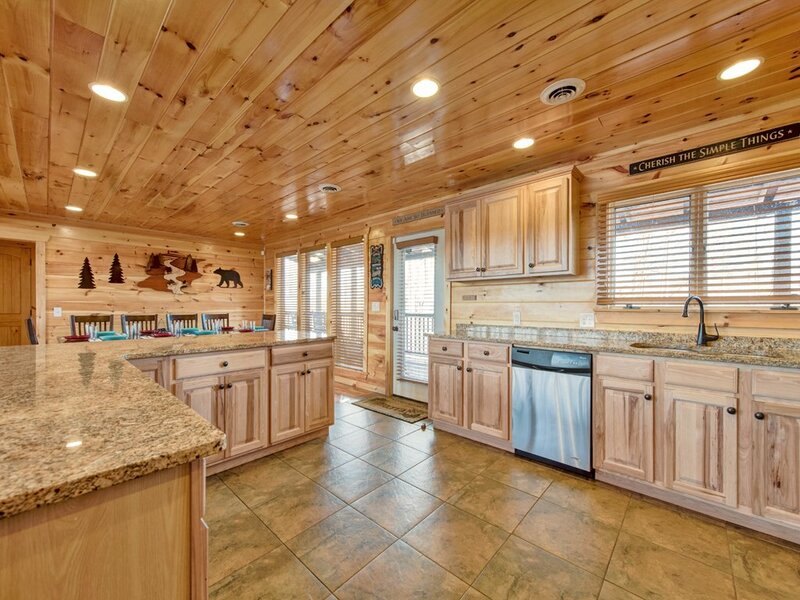 Just as important, the kitchen has all the appliances, cookware, and tableware you need to prepare meals to feed your hungry crowd. 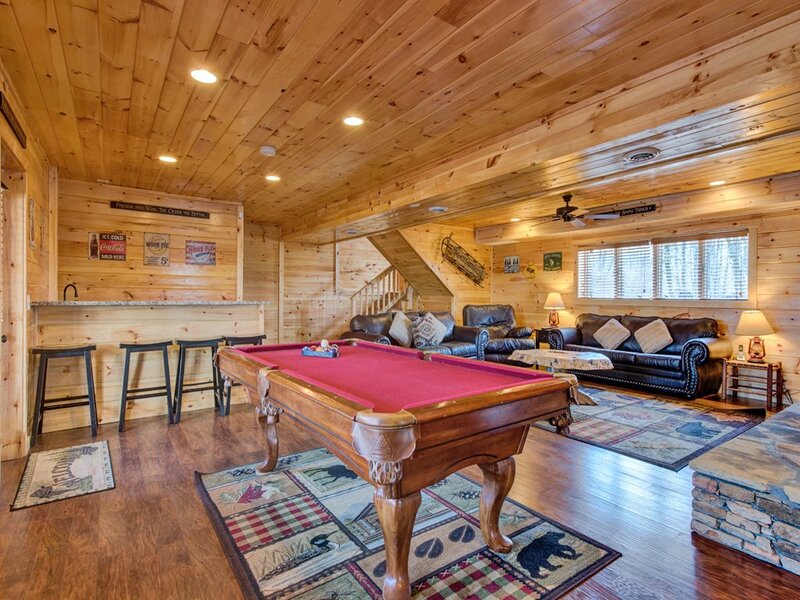 The kids—and the adults too, for that matter—will also love the downstairs game room. 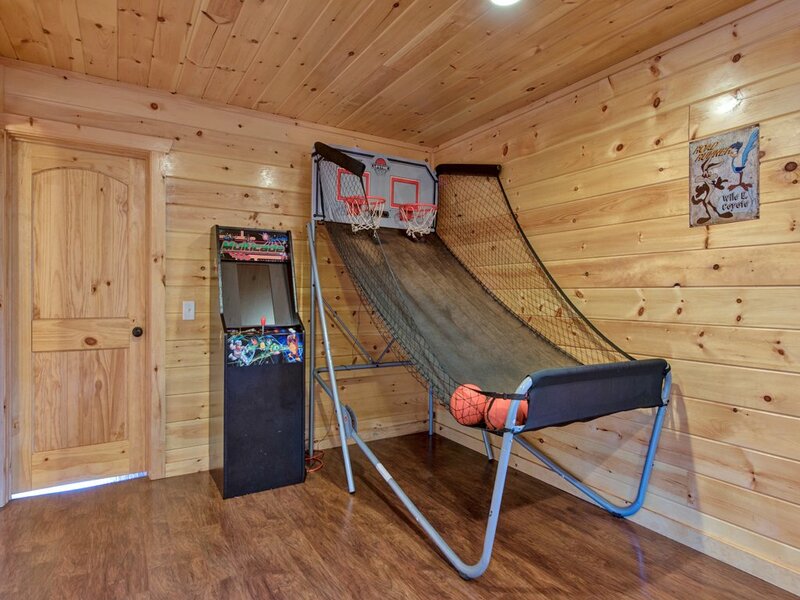 Along with a full-size pool table, it’s furnished with an arcade and an indoor basketball game. 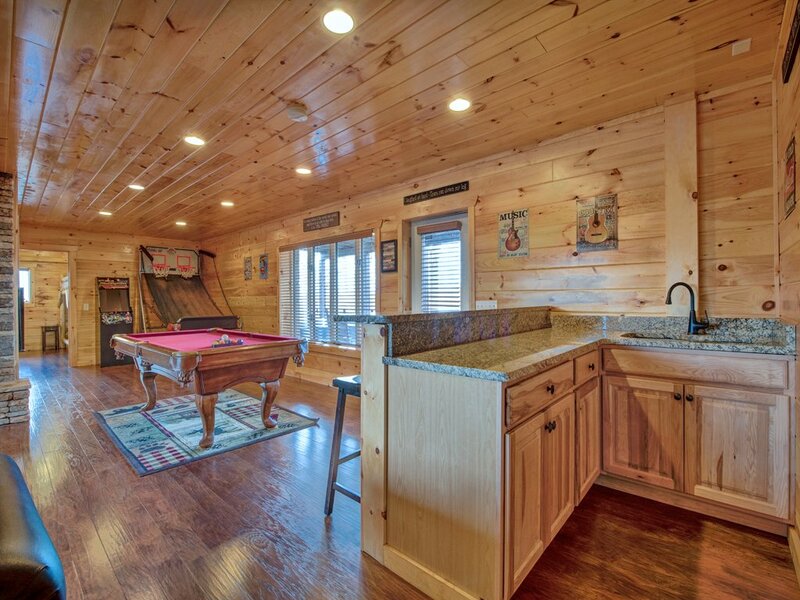 If you prefer watching to playing, sidle up to the wet bar or stretch out on one of the game room’s sofas. 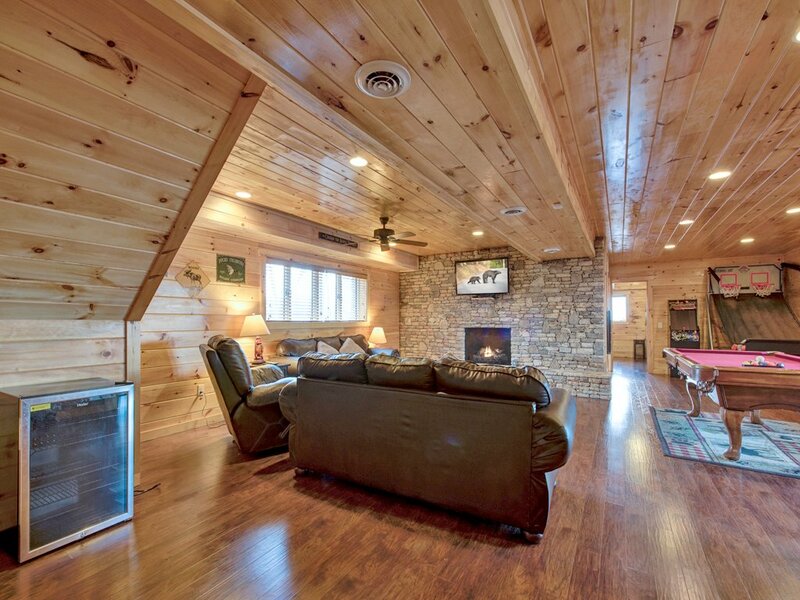 You’ll find the second fireplace down here as well, along with another 50” flat-screen TV. 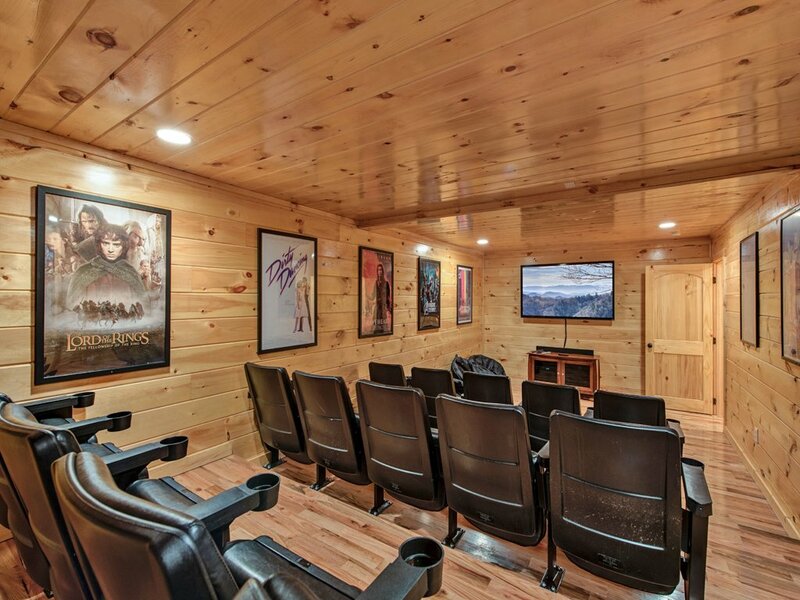 For watching a movie or a big game, you might want to head to the home theater, also downstairs. Not only is there a smart TV with a 70” screen and surround sound, but there’s also stadium seating (complete with cup holders!) for fifteen people. 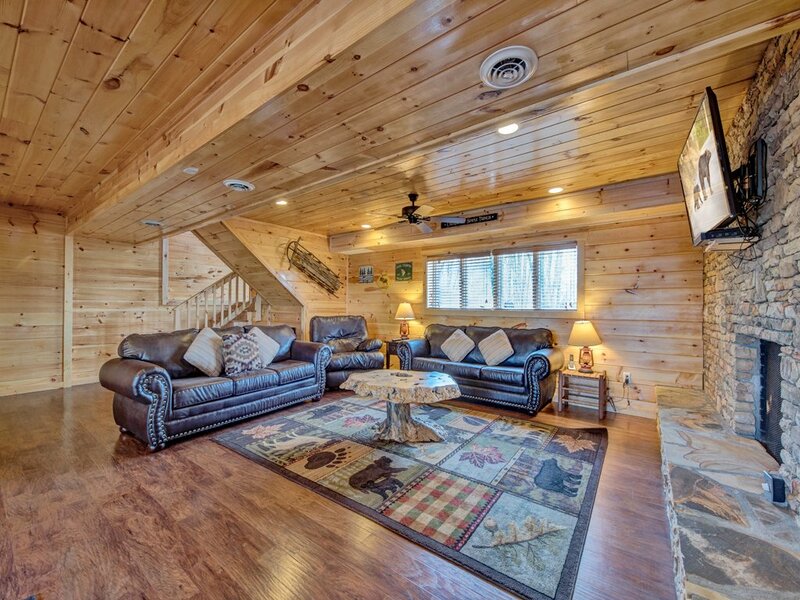 The six bedrooms, each of which has its own flat-screen TV, are spread out among the three floors. 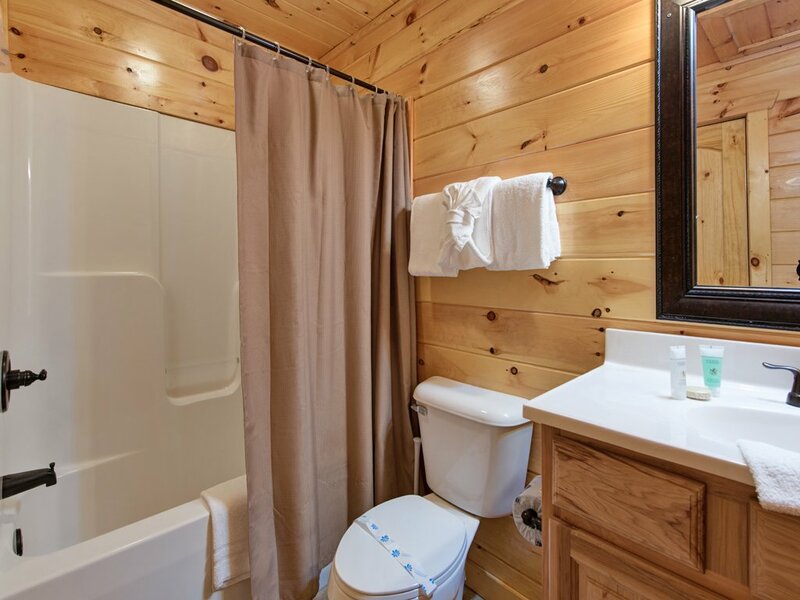 The top floor and the main level have four en-suite bedrooms altogether. 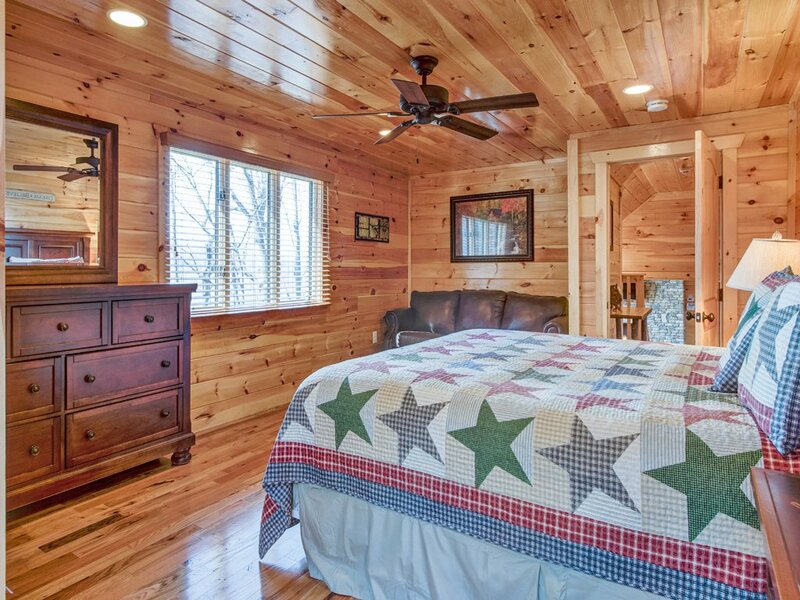 Two of these bedrooms—one on each floor—have a king-size bed, perfect for couples hoping for romance. 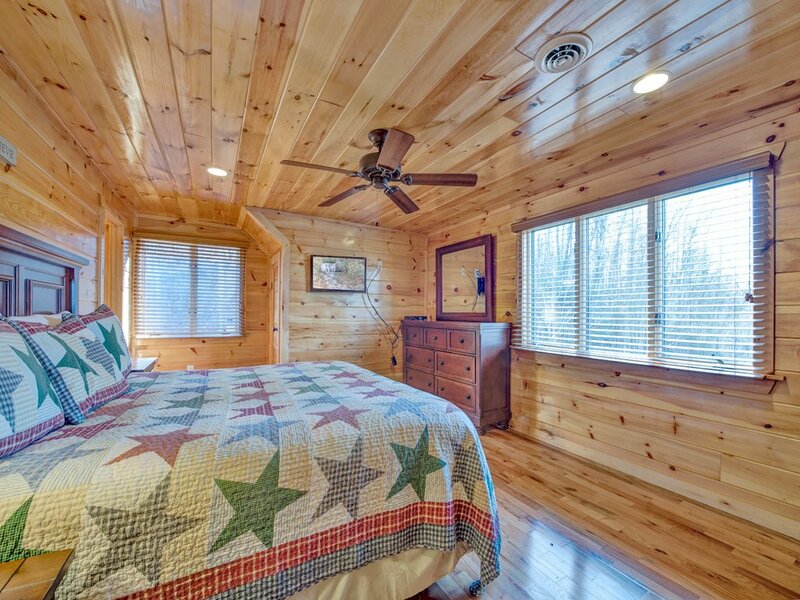 The other two bedrooms include a king-size bed plus a sofa that opens into a queen-size bed, making them well suited for families. 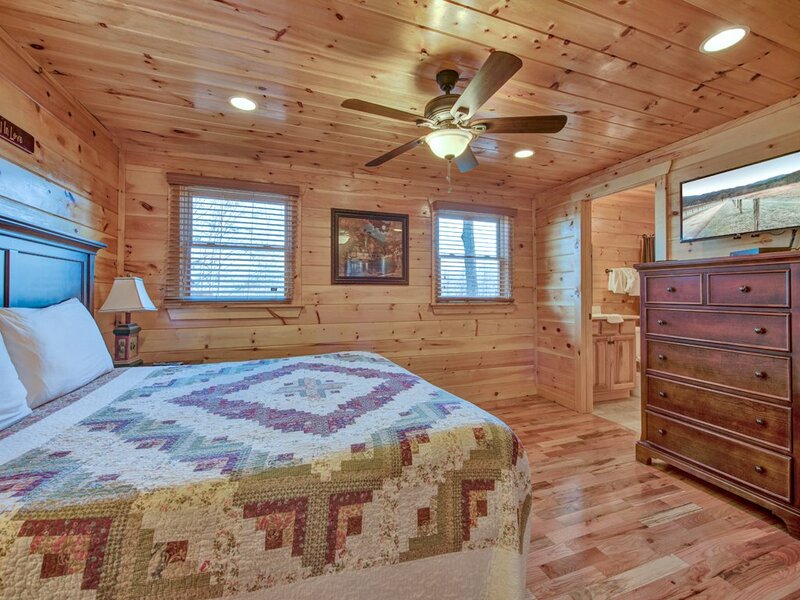 The remaining two bedrooms are downstairs. 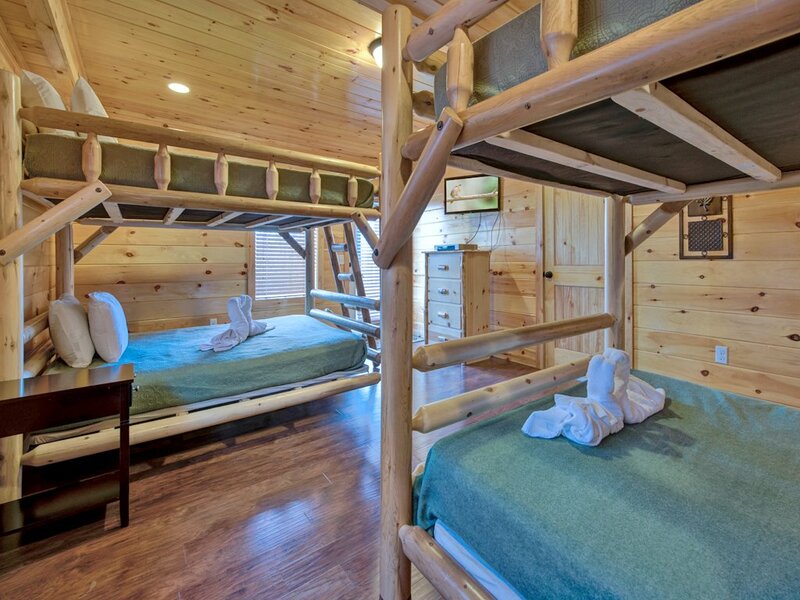 One has a pair of queen-size beds, while the other has two sets of queen-sized bunk beds so that up to eight people can sleep there. 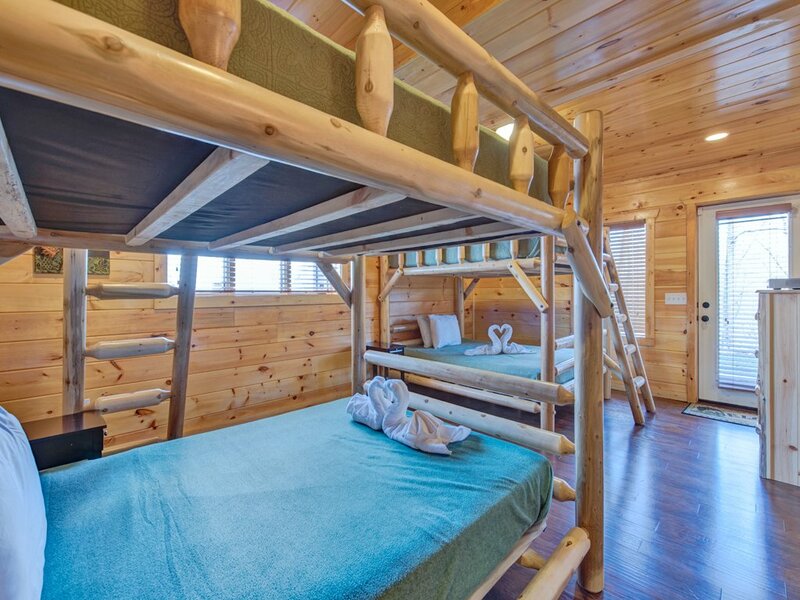 The kids will have a blast making this bedroom their private clubhouse—every night will be a slumber party! 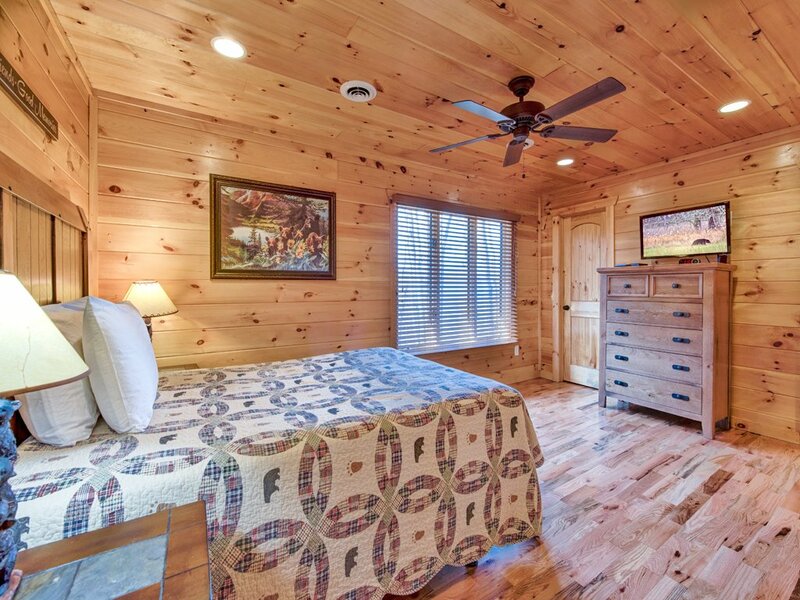 And if you have still more guests, one of the game room sofas opens into a bed for two. 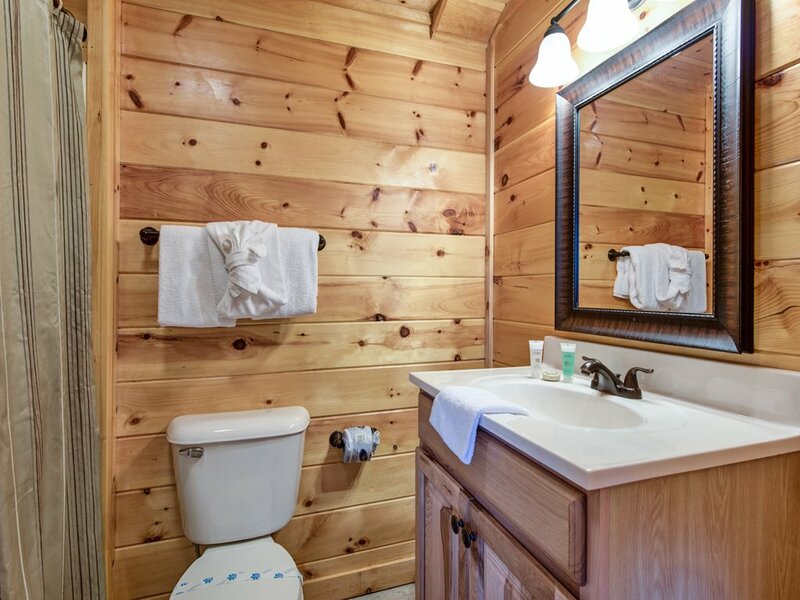 There’s a bathroom for each bedroom and, for added convenience, a half-bath on the main floor. 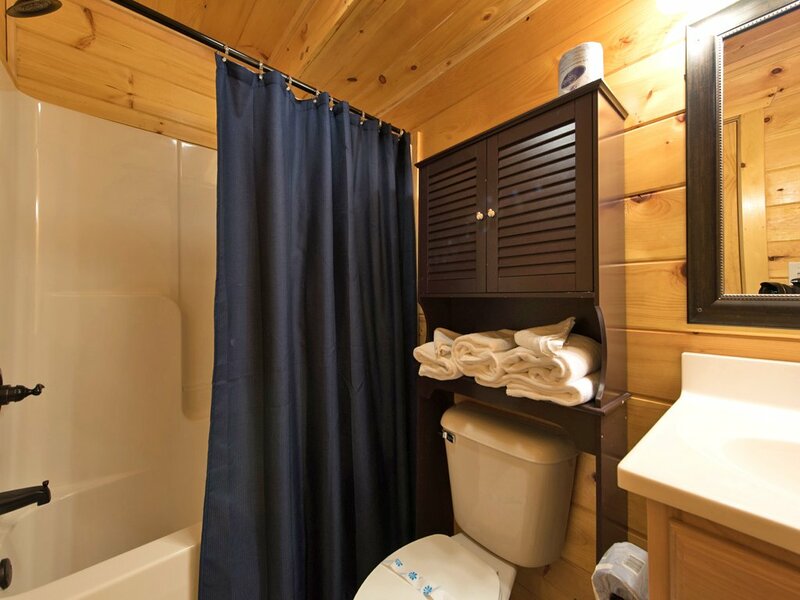 Speaking of convenience, Parkside Lodge has a washer and dryer too, plus free WiFi and plenty of parking. 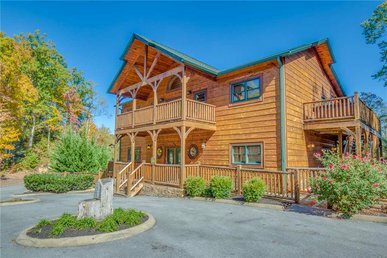 Even its location is convenient: just ten minutes from downtown Gatlinburg and Pigeon Forge. 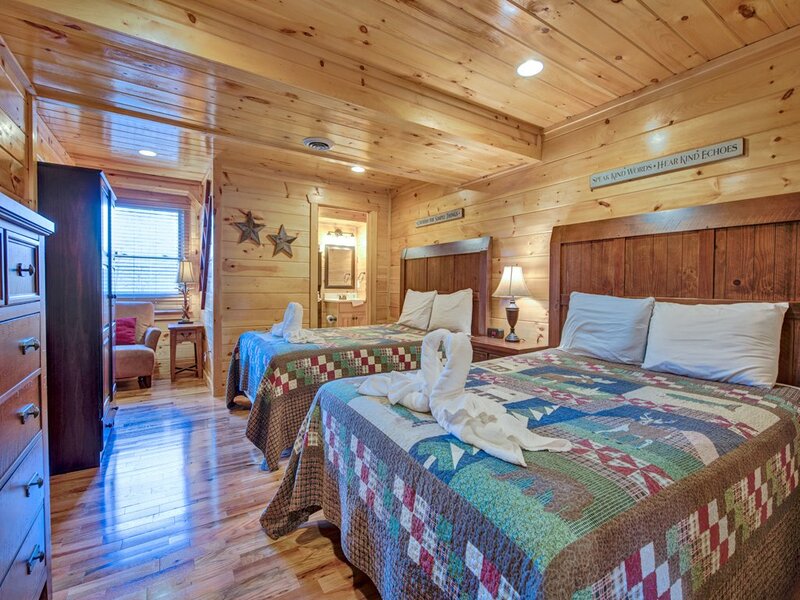 The only downside to Parkside Lodge: When you stay here, you might never want to leave! 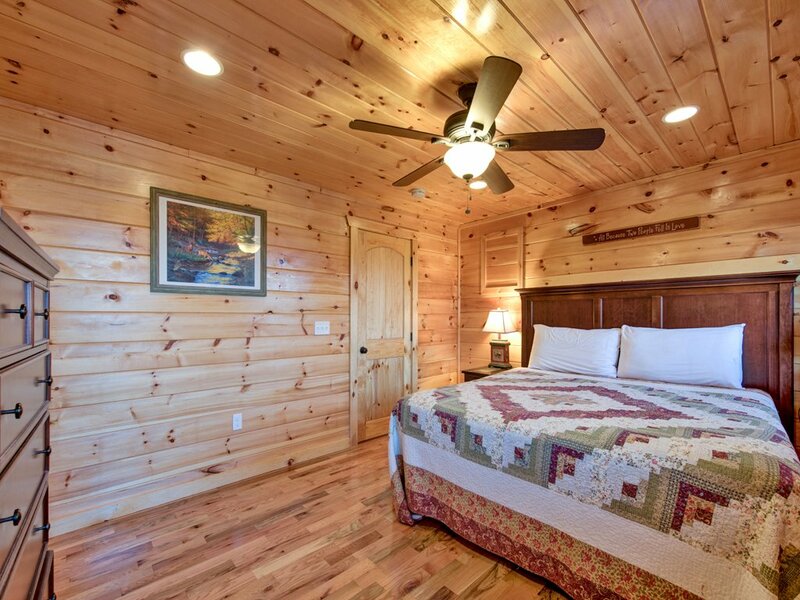 To experience its pleasures for yourself, book your stay today! 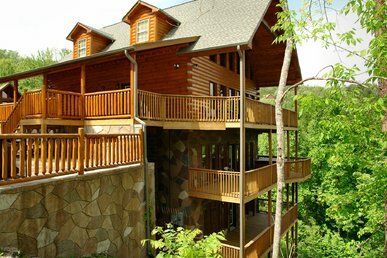 We brought twenty kids ranging in age from 12 to 17 to stay in Pigeon Forge for three days. 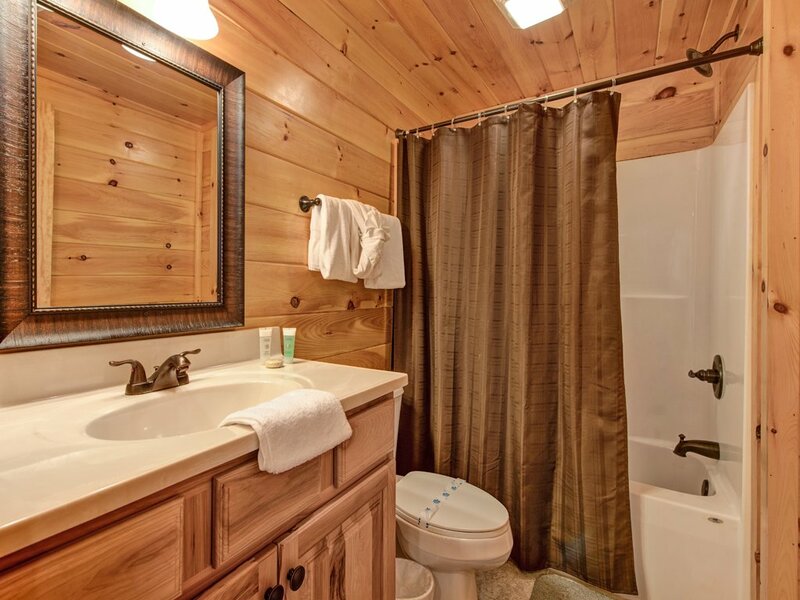 The home was well equipped and extremely clean.The location was perfect. We all loved our stay. Highly recommend it. Spent 4 days with 22 high school friends celebrating our 50th birthdays this year. 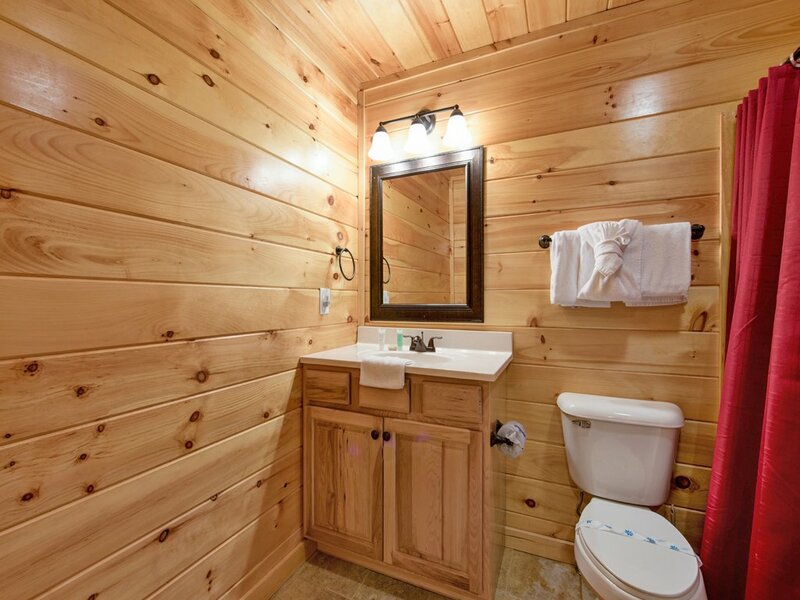 Pleasantly surprised by the beauty of the inside of the cabin. Great location. 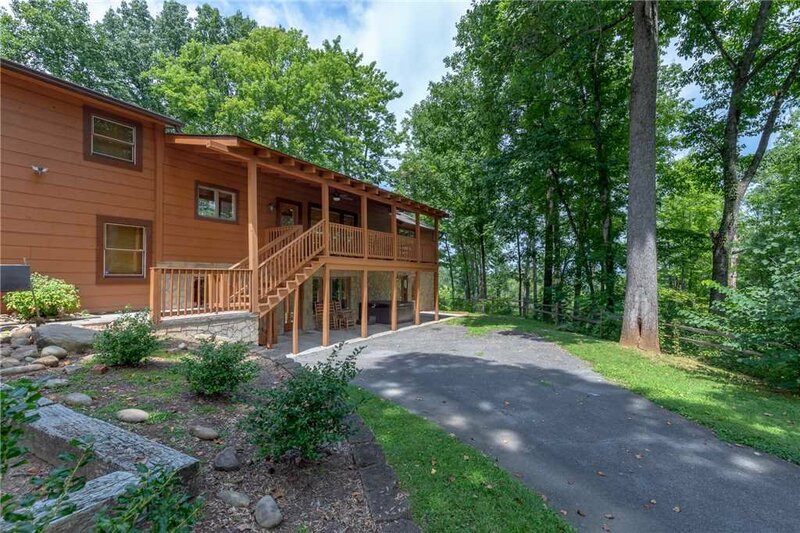 Great for a group or for a few families to vacation together. Fire pit was great to gather around and sing songs. Will definitely book again! 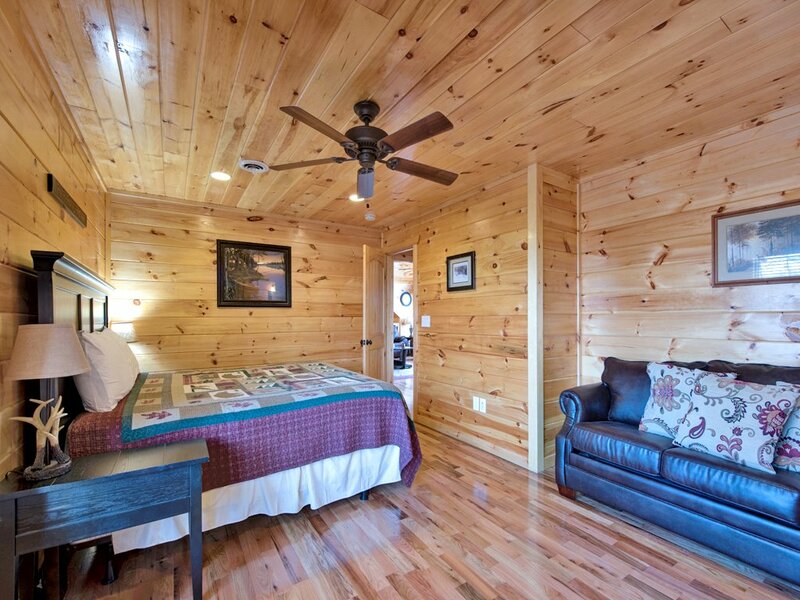 Thanks for choosing Parkside Lodge on your recent trip to the area! 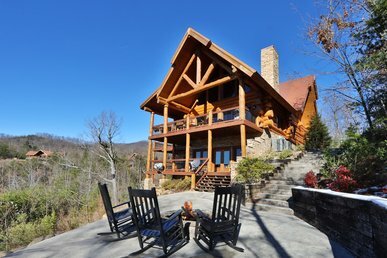 We are happy to hear that you enjoyed this beautiful property and we hope to welcome you back again in the near future. 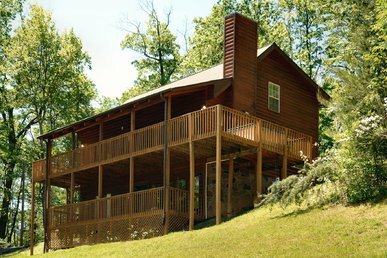 My family gathered at Parkside Lodge from all over the United States. 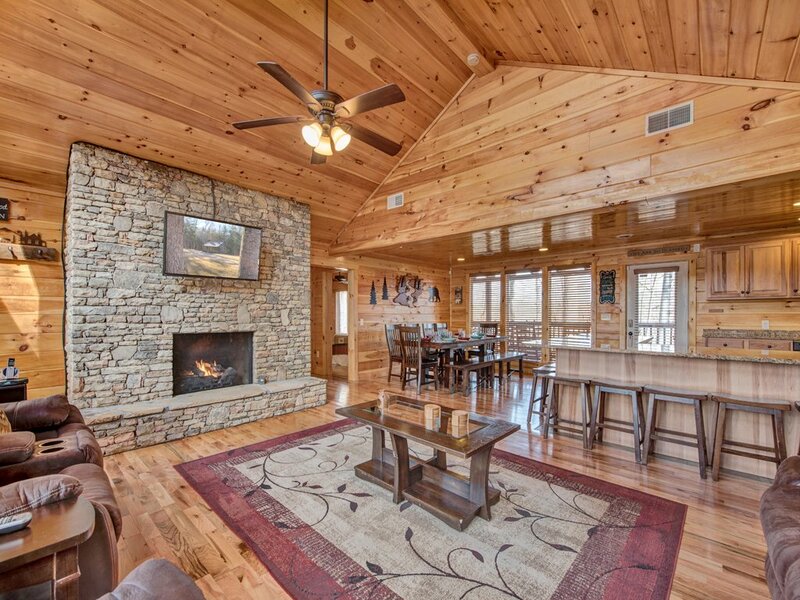 We were blown away with how large spaces were and how beautifully the interior was decorated. As my family explored all the rooms, I heard 'Wow' over and over. 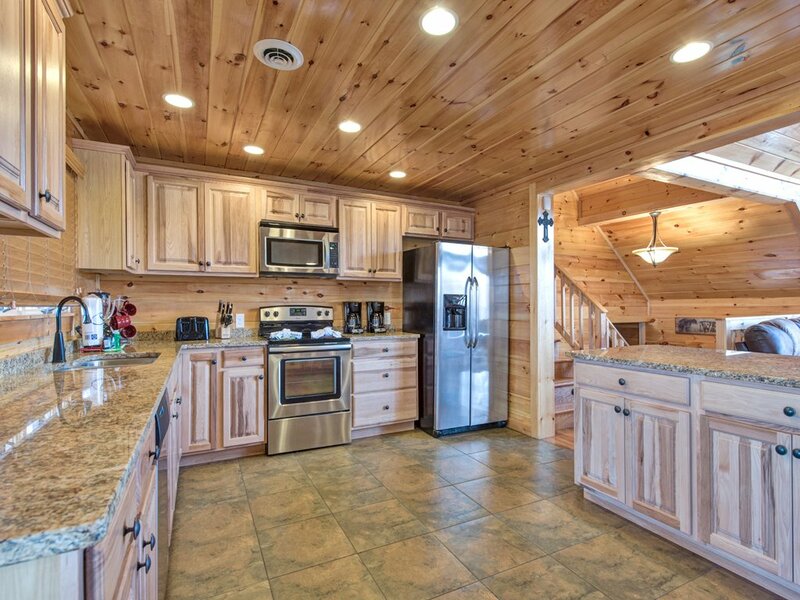 The kitchen was well furnished with dishes, pots/pans and new appliances. The furniture looked new and there was plenty of seating for everyone. The rocking chairs on the deck stayed busy most of the day and at night the fire pit was put to good use. 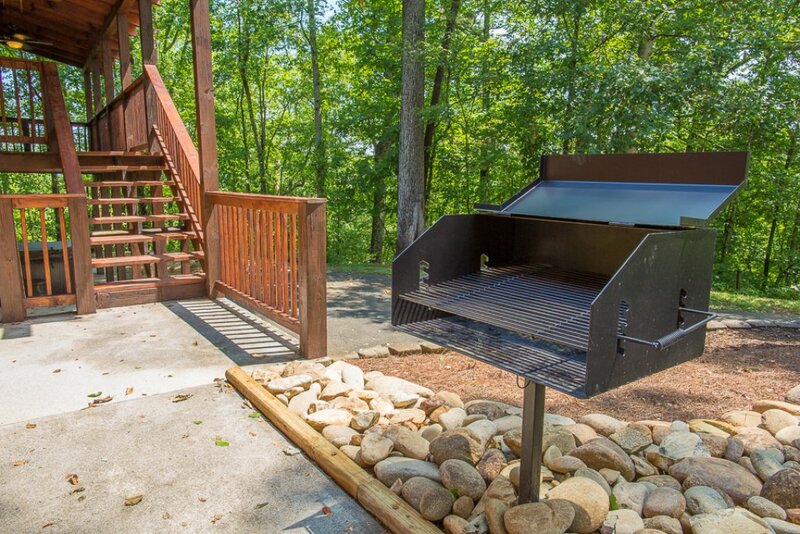 One evening, after grilling steaks on the large outdoor grill, a black bear wandered by to see what smelled so good! There was plenty of parking and the area was private without feeling isolated. We had the best time and would recommend this to anyone looking for a place for a large group. 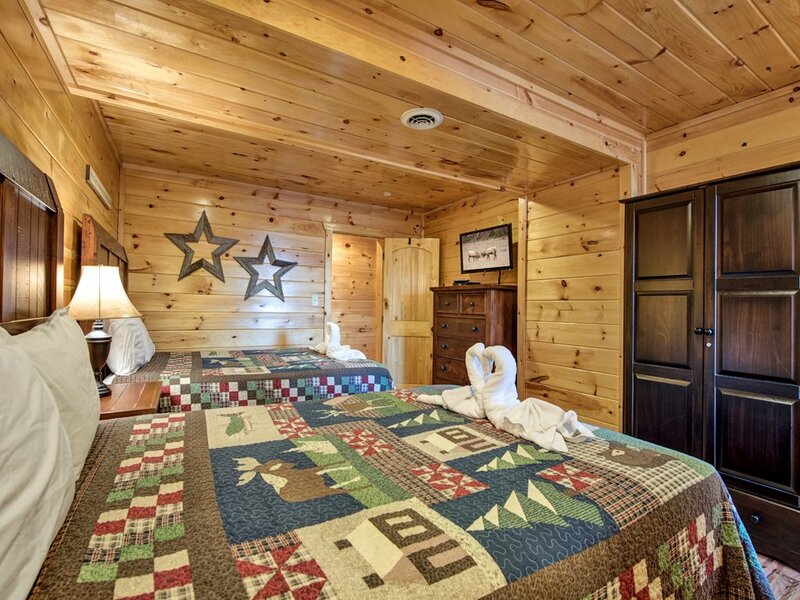 Thanks for your review and four-star rating of Parkside Lodge! We enjoyed hosting you and your group - come back soon! Really good experience here. 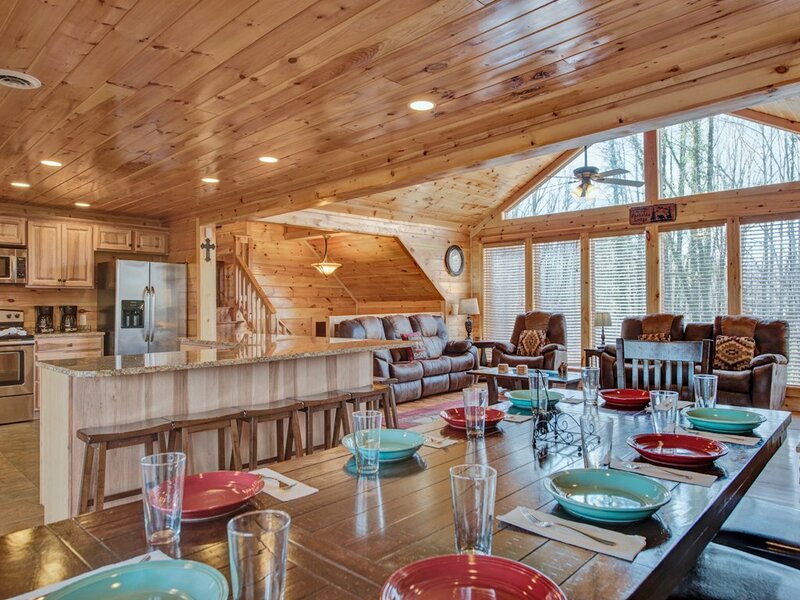 The cabin was unbelievable. We had a large group and never felt cramped or on top of one another. 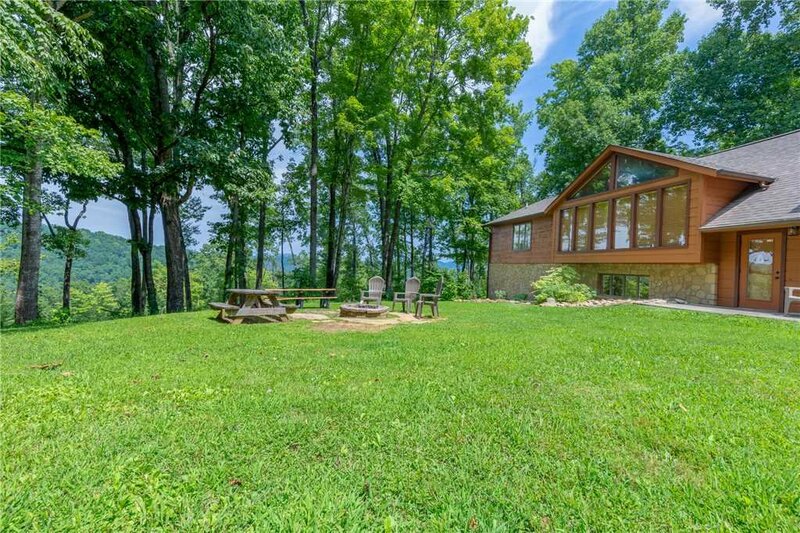 The cabin was secluded and somehow still close to everything. We loved it! The check in/out process was streamlined and made arrival and departure painless. 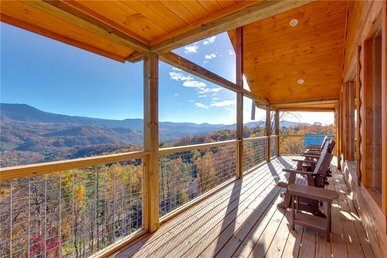 This cabin was in a perfect location from Pigeon Forge as well as Gatlinburg. We did see a LARGE black bear the first morning in the back yard! 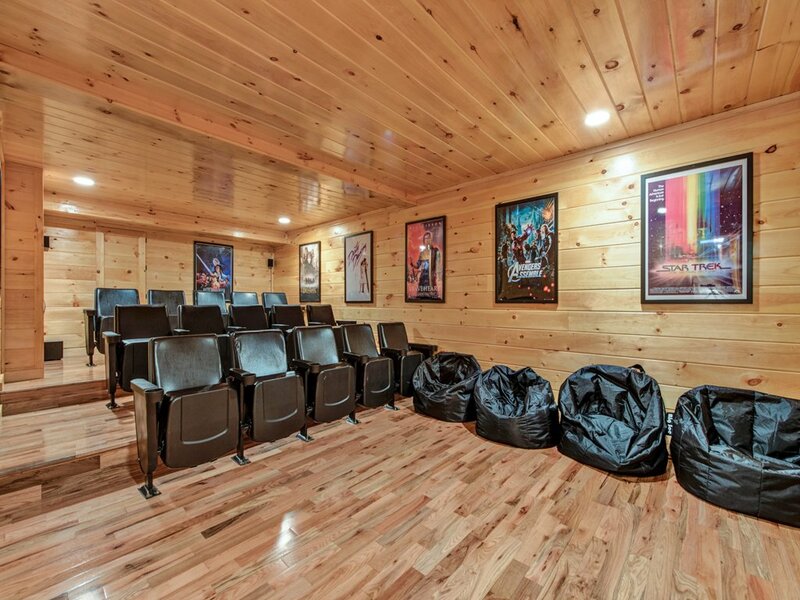 Theater room was nice and there was plenty room throughout the cabin for 24 of us. 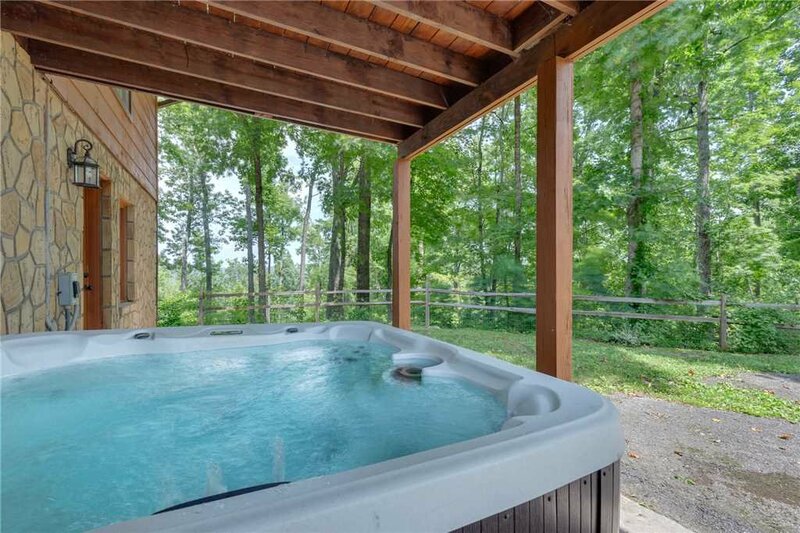 The views were minimal and hot tub was not working properly, only one set of jets worked out of 6. 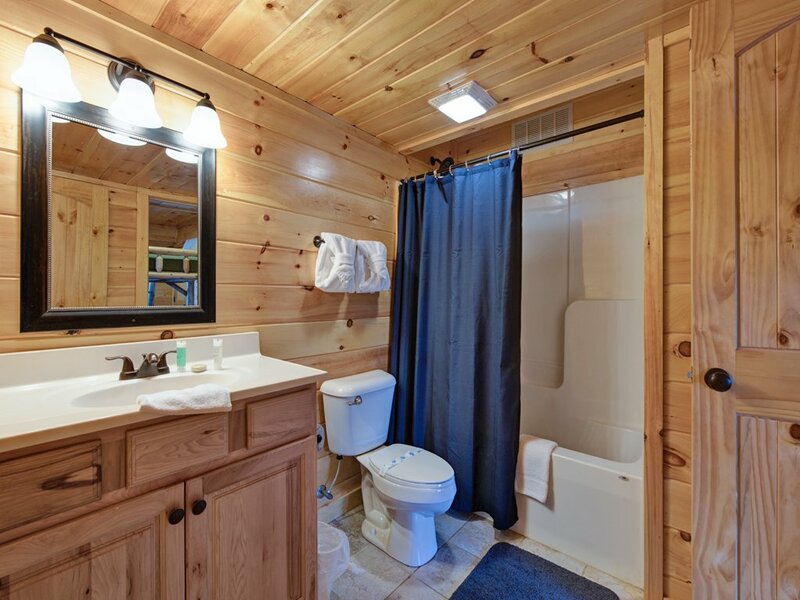 My family was overall pleased with this cabin, but I will be looking at other facilities for my next visit. Thank you for the four-star review and comments! We are happy to hear that you enjoyed your time here. We will look into the issue with the hot tub jets and repair ASAP - thanks for letting us know. Come back soon! 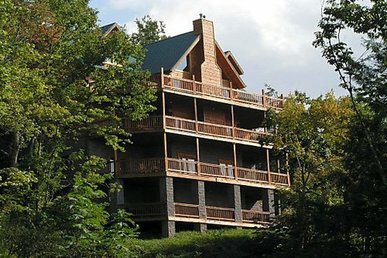 We took our children and grandchildren (total of 17) to Gatlinburg and stayed in this lovely cabin. Perfect set up for our gang. 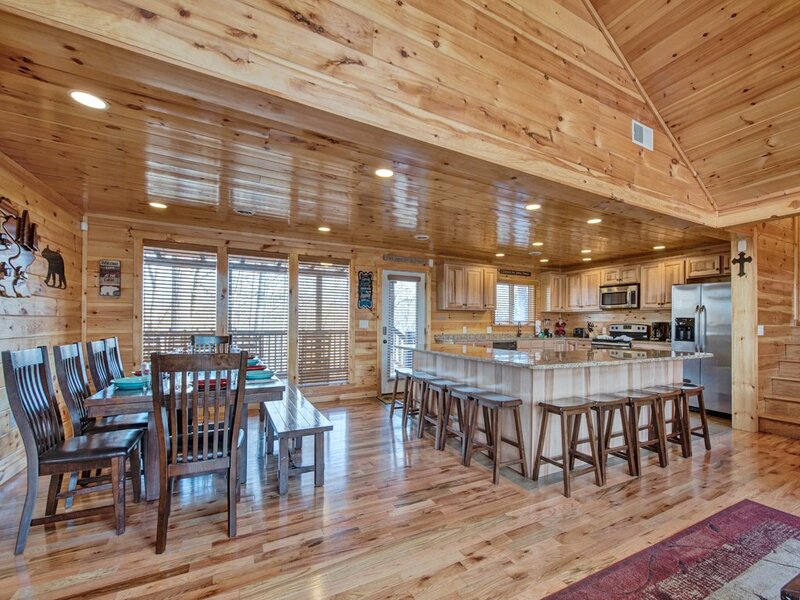 Everyone LOVED the kitchen and the ability to all gather around comfortably and enjoy breakfasts and other meals. 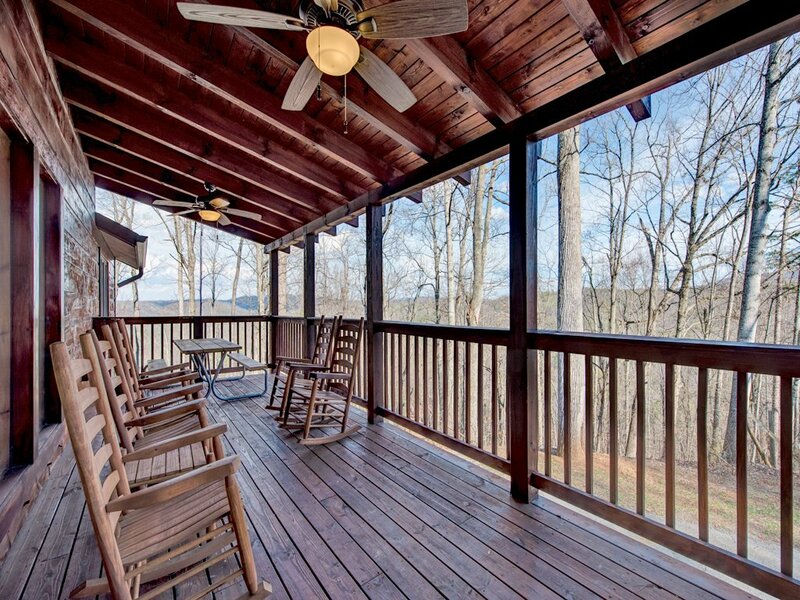 Porch time was special as well. The little ones were THRILLED to have their own movie theatre. 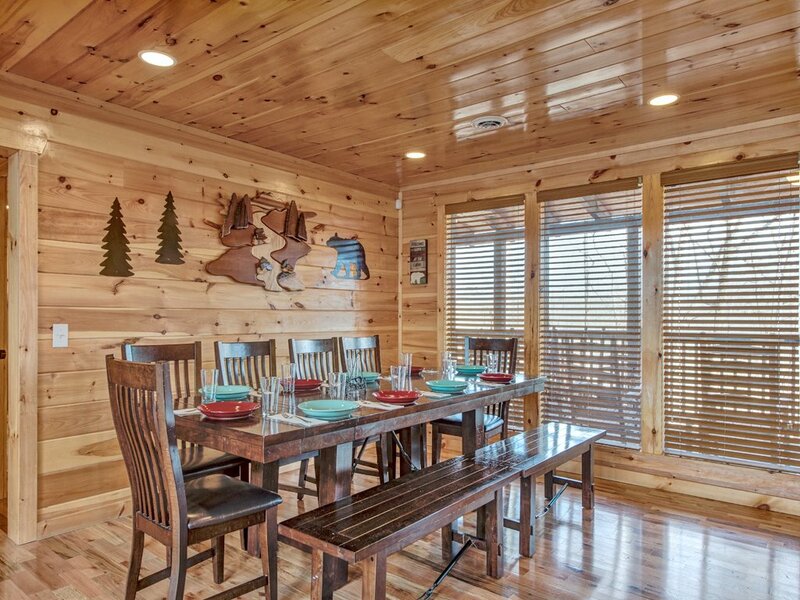 Lovely cabin and wonderful memories made. Overall, great vacation at a good location and nice place. It was nice a very wonderful home as a Interior Design the open floor planned and sky ceilings made this house so amazing. One of the sofa needs be replaced or updated, but I love it. The location was to high for me with the roads, and we drove a Ford F-250 (laughing out loud) I was scared!!! But the morning sound was breathtaking with your favorite cup of coffee. Once again it was wonderful thank you for letting us stay!